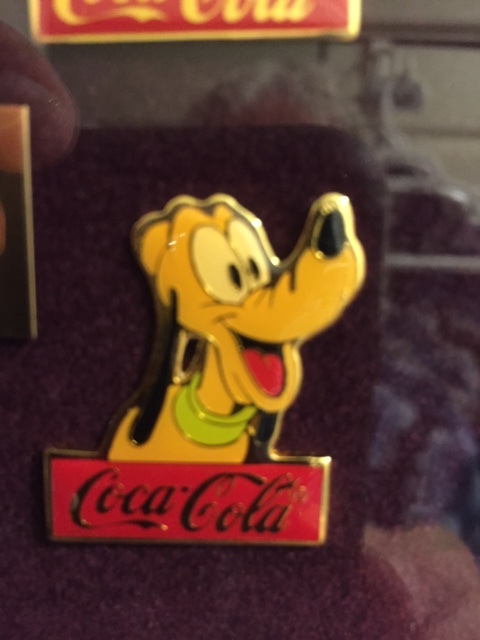 Pin in a collection from Disney World we inherited from my mother-in-law. Today New Horizons, the space probe launched more than 9 years ago, makes its fly-by of Pluto, the traditional ninth planet. I’ve experienced a couple personal fly-bys concerning Pluto, the first whimsical and the second substantial. Several years ago the science teachers convention was held in Greensboro, and our astronomy club decided to provide some telescopes outside for the conventioneers to enjoy during breaks. Unfortunately it was cloudy so we moved the telescopes inside. I pointed mine down a long hall aimed at a picture of Saturn I had taped to the wall. The keynote speaker, Dr. Neil deGrasse Tyson, walked by and looked thru my ‘scope and we spoke briefly. A fellow club member came over and instigated a conversation about Pluto. I was against changing its status, and Dr. Tyson and I had a pleasant, quick back-and-forth. Since he had to get to the podium to give his talk, we agreed to disagree. Sometimes I tell the story as if I almost convinced him to see it my way, to keep Pluto in the “planet” category, but that’s probably just my wishful thinking. A funny story. In 2009 Dr. Harold F. Levison from the Southwest Research Institute came to Guilford Technical Community College to speak at the annual Astronomy Day lecture. Dr. Levison and his team have done some ground-breaking work on early planetary migration on our solar system and his talk was fantastic. Afterwards, I had the opportunity to speak with Dr. Levison and our conversation somehow came to the status of Pluto, and I expressed my continuing thought that the small little orb be re-instated as a planet. Dr. Levison listened to my arguments. He listened carefully and came to understand the reason for my position. I had no scientific or observational reason to want Pluto classified as a planet. My main reason I wanted to Pluto to stay a “planet” was that Pluto had always been a planet, at least during my lifetime. That was the crux of the matter, and Dr. Levison knew exactly how to straighten me out. I heard Dr. Levison remind me that in science we gather evidence, we collect observations and new data, we re-examine and sometimes reclassify. In science we do not support an idea or concept just because others before us did. We consider what we have learned in the meantime. That query marked the end of my opposition to reclassifying Pluto as a dwarf planet. Will that small orb, the one exciting us in the news today, always be a dwarf planet? I don’t know. After more exploration, more observation, more data collecting, more thinking, future scientists may decide that a different classification scheme is more helpful in understanding the Pluto, our solar system and the universe. Will I like the change and be comfortable with it? Probably not.